During crisis, you find yourself contemplating as both a way to face what is happening to you and a way to remove yourself from it. You get lost in thought and catch yourself standing still, staring at nothing. Mentally beating a dead horse from every angle. The thoughts can be overwhelming and have actual weight. Expression amid this type of turmoil is not merely difficult, but can be downright impossible. It becomes a battle in itself to find a calm place, to share or give coherency to this massive internal conflict, which on the outside appears so still. It can be extremely isolating and lonely. You can feel like you are slowly going insane. I reached for any outlet I could to escape the fear, wrestle emotions, deflect pain, and understand the scope of the situation. Books, movies, cooking, art, running errands and even cleaning, became a way to keep moving during the contemplation so I did not get trapped in one place or mindset. But, for me, during the darkest times, music created a shelter in the storm. I used music to alter my mood, clarify my focus, share my thoughts, and give words to things I could not adequately express. It also became a source for allowing others access to the hidden parts of the struggle, without having to vocalize the trauma myself. Music talked for me when I couldn't. I would "contemplate" to a vast array of different types of music. Whatever sound best served my emotional need of the moment. Silly songs which could make me feel giddy and leave me smiling. Soft ballads which swept me into a more tender place. Loud, angry music whose rage could keep me from putting my fist through a wall and still let me vent. Classical instrumentals that gave structure to the chaos. Sad songs which allowed me to feel less overcome by my own tears. Music that pleaded, questioned, answered, and contemplated for me. I actually learned how to do this to the extreme, because a very close friend does this all the time, to the degree that basically his whole life has some sort of soundtrack. I found comfort in how he would explain complex feelings in the simple act of sharing the song which said what he struggled to say. So, I stole this philosophy and incorporated it into my crisis and healing. Music allowed me to contemplate without being swallowed by paralysis and allowed me to share when I felt the most closed off. I found some of my deepest, most important conversations during my darkest hours were quiet serenades of "Have you heard this one?" and "This reminded me of you." Hours and hours sharing songs that could talk for us. Music that spoke volumes. It enhanced my world and lowered my walls. These song conversations allowed me to breathe again. One song in particular opened for me a place of grief, fear, hope and healing that I never saw coming. Trauma is unique for everyone that goes through it, because the same event that happens to you is lived with an alternate perspective by the people sharing it with you. This can be easy to overlook when you are in an understandably selfish place of fighting to survive. After my surgery, when I was the most deeply entrenched in the reality of my survival and the pain of healing, my friend was trying to find a way to share with me about what my 16 hour surgery had been like for him. The fear of losing me. The waiting and worry. The hope and despair. He was struggling to convey how powerful and life-changing an experience it was from his view. And, for a moment or two, I thought I totally understood it, then he played for me the song he had listened to over and over again while he was waiting all those hours praying I would wake up. 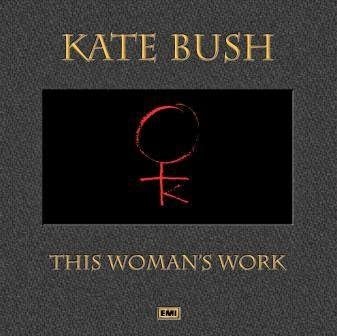 This Woman's Work, by Kate Bush. A song I had probably heard a handful of times, but wasn't really the kind of song I would have previously been affected by. But, in the moment he shared it, I lost the ability to breathe. I saw completely for the first time the scope of what my survival and struggle were. How one person's trials are shared so completely by those who love them. How important the fight to live is. How scared and hopeful we can all be. How simple yet meaningful it is to be utterly human. I saw that it was alright to break down, reach out, and hold on. I knew it was okay to be hurt and keep breathing. At that place and time, in that single moment, I knew how important it is to love and be loved. It makes all the difference. Even years later, just hearing the first notes of that song, instantly takes me back to that moment. Full of the most exquisite pain and hope, soft grace and tears. It reminds me of who I am and what I have survived and who shared it with me. It sings to me to remember to take the time to let love in. Its simple serenade soars with the reminder to never forget. We don't go through life alone. We survive together. We should never forget and always be thankful. Whatever your crisis or trauma, no matter how overwhelming the contemplating can be, find something that speaks both to you and for you. And, share it with someone you love.